Copyright © 2009 Jon Seligman. All Rights Reserved. to his research in Jerusalem at the end of the war in 1919. In 1922, he published the Hebrew song book, "Sefer Hashirim," which includes the first publication of his arrangement of the song Hava Nagila. 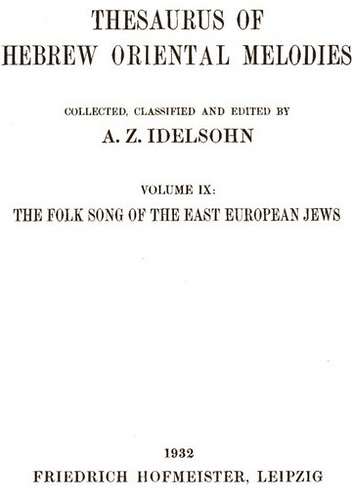 Idelsohn also made important contributions in the area of comparative musicological research with his work on the ties between Jewish and Christian liturgical music. 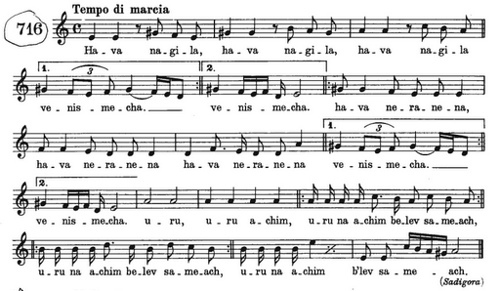 Though less well known, Idelsohn also dedicated himself to the study of Near Eastern maqam systems, which is outlined in his work Die Maqamen der arabischen Musik (1913). 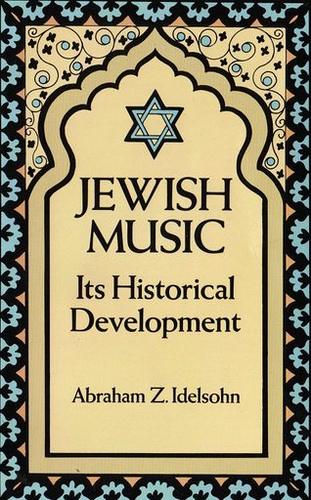 Idelsohn's enormous literary output, as well as his field recordings (which number over 1,000) laid the foundation for the modern study of Jewish musicology. 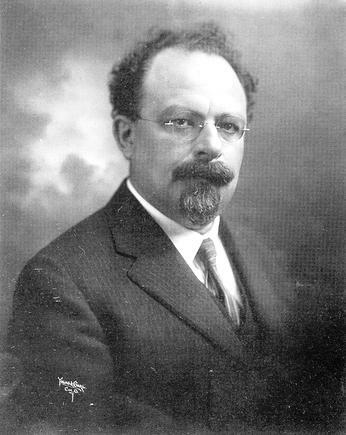 Idelsohn died in Johannesburg in 1938. The ten volumes of Idelsohn's seminal work studies Jewish liturgical and secular music, with cultural, linguistic and theortical analysis. Idelsohn's most widely known work and still a classic in the field of Jewish music. I was born in the fisher-hamlet Felixburg (Jurkalne), on the Baltic Sea, between Windau (Ventspils) and Sackenhausen (Saka), Latvia. My father was Schochet and Baal-t'filloth in the district. When I was less than six months old, my parents moved to Libau, where, due to the efforts of Dr. Philip Klein, then Rabbi in Libau (later in New York), my father was appointed overseer of kosher meat in a non-Jewish butchery. In my early childhood my parents lived next to the "Chor-schul" and my father used to take me over to that cold, unheated house of worship. The chazzan was Abraham Mordechai Rabinovitz. His strong tenor-voice used to chill me; he had no sweetness in his voice. I remember the Congregation preferred to hear Zalman Schochet, though very old, or Orkin of the Zamet Synagogue. Little did I realize that Rabinovitz will later become my teacher. The above mentioned cantors had less voice than he, but much sweeter, and their singing was with more Jewish feeling. From my father I learned to love the synagogal modes and "Zemiroth" as well as Jewish Folk-Songs. At home I received an orthodox education and appreciation for everything Jewish. I visited old-fashioned "Chadorim," although there were many modern ones in Libau (Liepaja); my father wanted to implant within me the genuine Jewish piety. At the age of 12 years, I was sent to Lithuanian yeshivas, where I remained five years. During that period I acquired a knowledge of Jewish life. Upon my return home, I decided to take an examination at the Gymnasium and prepare for an intelligent profession. I secured a tutor and started studying. Suddenly I felt an inner call for music and went to the above mentioned Rabinovitz, who accepted me in his choir. There I remained for a half year, despite my father's protest that I shall become a "chor-chazan." His uncle never entered the Choral-shul because of the ban the ultra-orthodox Rabbis laid upon it when it was built. Due to my brother-in-law, who came to visit us, but had to stop in Prussia, because he had no legal right to enter Russia, we journeyed there to see him. While in Memel (Klaipeda) (then Prussia), the idea came to me to go to Koenigsberg, to Edward Birnbaum. He accepted me and recommended me to the director of the Conservatory. At the time I knew nothing of Birnbaum's work, all I knew was that he was the successor to the famous Weintraub. I found him steeped in German music, his voice insignificant, his chazanuth unappealing and not Jewish. I visited him only a few times; he never instructed me and never showed me his collection. After a few months I decided to proceed to London, according to my brother-in-law's advice. Reaching London, I was advised to enter the Jews College, but I had nobody to guarantee my upkeep during my stay there, so my meeting with Dr. M. Friedlaender was of no consequence. My parents wrote me, that Rabinovitz was willing to take me back, but I had no means to return. In my distress I turned to Israel Zangwill for help. He rcommended me to the Board of Deputies and secured my passage home. Upon Zangwill's question, how can I return to Russia, where Jews were so maltreated, I answered that I prefer to be with my brothers even in a place like Russian than to live in a free country like England and assimilate. Rabinovitz promised to instruct me in Chazanuth and in European music, and he kept his promise. During that year I again sang in his choir. He taught me a lot of things, such as sigh singing, theory, voice-training and the beginning of harmony. He acquainted me with the Chazanic literature of Weintraub, Sulzer, Lewandowski and others. He implanted within me an appreciation for good Jewish melodic taste and he gave me also an idea of classic music from the works of Bach, Handel, Haydn, Mozart, Schubert, etc. At the same time I was an ardent reader of Modern Hebrew literature, from Moshe Chaim Luzzatto's poetry to the "Hashiloach" and the "Hador." I became an admirer of the style and articles of Achad Ha'am, who became my guide and pathfinder in my confusion - the perplexity of a modern Jew. The day I arrived in Berlin I was accepted in the Stern'sches Conservatorium in the opera-class of Siedmann. The Director of the institution was Gustav Hollaender, a converted Jew who developed in me Germanistic, chauvinistic ideas. His brother, Victor H., who was also present, engaged me in the choir of the Charlottenburg Synagogue, of which he was the leader. My first participation in the opera, however, ended badly; disgusted with the immoral conduct of the players, I gave up my studies and, influenced by Tolstoy's ideas, I became a follower of them. I abandoned music, the Conservatorium and modern luxury and decided to become a farmer in Palestine. For this purpose I visited S. Bernfeld, who laughed at my fantasies and told me of the struggle of the poor colonists in Palestine. On the other hand, R. Brainin treated my differently; he wrote to a Baron Manteufel in Greece, who maintained a farm school, to accept me. Unfortunately his reply came too late. The whole summer I lived as a Tolstoian, until my meager resources were at an end. At that time there came to Berlin Cantor Boruch Schorr, who looked for singers. My colleagues who accepted Schorr's invitation, induced me to do likewise in order to earn something. Schorr was already old and he had no voice at all; nevertheless his Jewish admirers clung to him enthusiastically. The compositions he gave us to sing were of very mediocre musical value, although some expressed the Jewish sentiment. My preparation in a Wentraub-Sulzer-Lewandowski repertoire was of no avail, there in Augsburg, I had to learn the South-German chazanuth, which is German, consisting of German melodies of the 17th and 18th centuries. On my way to Berlin I learned from Emanuel Kirschner, chazzan in Munich, that in Liepzig a chazzan was sought. I stopped there and was accepted; one of the Board was a disciple of Weintraub in Koenigsberg. There I would sing real Chazonus. While in Leipzig I studied harmony with Jadassohn, counterpoint with S. Krehl, composition with H. Zullner and history of music with Kretzschmar, besides voice-training and piano. There I was able to attend the Gewandhaus concerts under A. Nikisch. At that time, the South-German Chazanuth was considered genuine Jewish. I, therefore, took a position in a Bavarian community, Regensburg, as Chazan and Shochet, but after two years I received a call from my relatives to come to Johannesburg, Africa, to become a chazzan there, which I accepted. I hoped to be able to live there a genuine Jewish life and to sing the Jewish song, but I soon realized my disappointment. I agreed to go to Vienna, where I was given two rooms by Prof. Exner to work out my records. I applied also for a subsidy from the Academy for the publication of my collection, which I called "Thesaurus of Hebrew Melodies" and prepared six volumes. For this purpose I had to visit the well-known anti-Semite, Prof. Warabazeck, who received me cordially, and due to his influence, the Academy granted me a subsidy for my work. On the other hand the relation of the Vienna Chazanim was very unfriendly, almost hostile. At the same time (1913) there took place the Zionist Congress in Vienna, and I met there Chaim Nachman Bialik, who induced me to write some Hebrew essays for his magazine 'R'shumoth' which he intended to bring out, a request which I fulfilled. The men friendly to me were Dr. M. Guedemann, Dr. M. Grunewald, Dr. Feuchtwanger - all Rabbis, also Dr. A Kaminka and A Stern (President of the Jewish Community). Very friendly was Prof. G. Adler of the University, who invited me to attend his glasses in Gregorian chant and to deliver some lectures. My work of the recorded songs and pronunciations I finished and submitted to Prof. Exner. It was published in the Academy Proceedings No. 175. At that time a fight between the Hebraists and the "Hilfsverein" schools in Palestine was going on. I, though an employee of the "Hilfsverein," decided for the Hebraists, although double salary was promised to my wife by Eph. Cohen. After eight months stay in Vienna I returned to Jerusalem and started my work in the Hebrew Schools. From my "Thesaurus" only the first volume could be printed, for soon the world-war broke out and all cultural activities had to stop. I was enlisted in the Turkish army, first as a clerk in the hospital, later as band master in the trenches in Gaza, from which I emerged after the armistice. In 1919 I returned to my teaching and research work. The Zionist Commission freed me partly from my work as teacher and I devoted this time for work on the "Thesaurus," to write the Hebrew introductions, the first of which became very bulky, and I had to separate from it the Yemenite Poetry, which was late published separately under the title "Shire Teman." In 1921 I decided to go to Europe to publish my works. I took my family with me. I arrived for the Zionist Congress in Carlsbad, where Dr. V. Jacobsohn, then head of the "Juedischer Verlag," bought my manuscripts of "Sepher Hashirim," and Bialik encouraged me to write a history of Jewish Music, the first volume of which he published in the "D'vir," the other four volumes remained in Manuscript. Up to date. Upon sending the second volume, Bialik wrote me... "Your first volume is still lying in our store, only a few copies are sold ... we have no courage to print the second one." In Carlsbad I met also the head of the K'lal-Verlag in Berlin, who published my "Z'lile Haaretz" and "Z'lile Aviv"; there I met also B. Cahan (the owner of "Yalkut") who brought out my "Sepher Hashirim" and "Shire T'filloth", 2nd edition. In Berlin in met Benjamin Harz with whom I arranged to publish my "Thesaurus" in Hebrew, German and English, and by the end of 1922 four volumes came out. During the year I was in Berlin, I materialized an old dream, I found a publisher to put out my JEFTAH, of which I wrote both the words and music and which was the first Hebrew opera ever written. Negotiations with the Oxford Press and other publishing companies were unsuccessful. After more than a year's stay in Berlin my friends advised me to go to America on a lecture tour, which I did. Before that I lectured already in Vienna, Berlin, Breslau, Posen, Leipzig, London, Oxford, Amsterdam and in other places. During my stay in Cincinnati, I added four more volumes to my "Thesaurus," making it ten volumes. Them President of the College, Dr. Morgenstein, secured funds for the 5th and partly for the 6th volume, but the American Council of Learned Societies decided to grant me a subsidy for all the remaining volumes, and thus I was enabled to publish my "Thesaurus" in ten volumes in German and English, the first five volumes also in Hebrew. From this work grew out several others: research in Liturgy, which I published in the "Thesaurus," Vol. 3 and 4; research into the Poetry, which I published in the "Hator" and "Hashiloah" and separately in book form under the title "Shire Teman"; pronunciation of Hebrew, published in the "Hashiloah" and in the "Monatschrift" 1913, which was put out separately as a reprint; a Manual, published in 1926 by the Hebrew Union College - an extract of the four volumes of the History of Liturgy which Holt published in 1932. The Brotherhood ordered from me the "Ceremonies of Judaism," and a these were put out in book form in 1929, a second enlarged edition in 1930, and a third edition in 1932. My activity as teacher of singing and Chazan gave me ample opportunity to create along these lines. 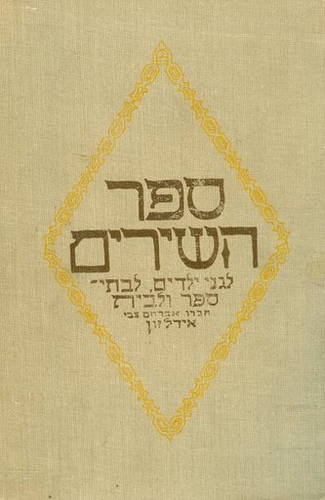 Already in 1908 I published in Jerusalem under my supervision two volumes "Shire Zion" for choir and solo, also a theory of music in Hebrew, "Torath Han'gina" (1910), and "Sepher Hashirim," vol. 1, likewise several essays in various periodicals, and "Shire T'filla". While in America, considering the situation in which Judaism placed, I composed and published two Friday-evening Services and one Sabbath-morning Service for four part choir with organ accompaniment, according to the Reform ritual; "Jewish Song-Book," two editions, the third edition is being delayed due to my illness. I also put out a Friday-evening Service for one voice with accompaniment. Lets Rejoice and be Happy. Let's Sing and be Happy. Awake Brothers with a Happy Heart! Hava Nagila is one of the most recognised symbols of Jewish life and culture. Originally a Hassidic niggun collected by Idelsohn, Hava Nagila became known as a Jewish folk song that gained popularity amongst the chalutzim. During the 1920's and 1930's, it was published in Jewish children's songbooks in Palestine, Germany, and the United States, and was commercially recorded by a number of cantors and Jewish folk singers. Since then, it has been performed and recorded by Jewish and non-Jewish musicians alike. The great popularity and far reaching recognition of Hava Nagila demonstartes how a song can become a powerful marker of identity. 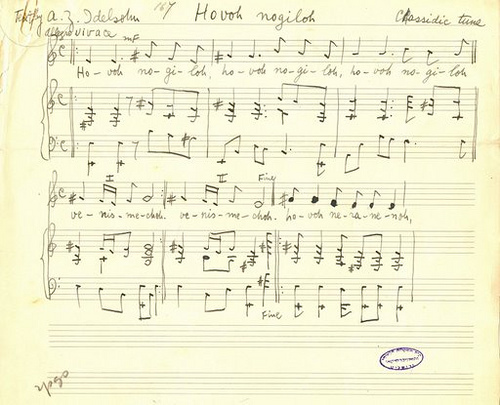 In Idelsohn's earliest manuscript, kept by the Department of Jewish Music of the Hebrew University of Jerusalem, a sketch of the song Hava Nagila is arranged for voice and piano. In the top right corner of the sketch, Idelsohn attributes the melody to a Hasidic niggun later noted in his Thesaurus as been collected from a descendant of the Sadigora Hasidic court residing in Jerusalem. The Sadigurer Hasidim took their name from the small town of Sadigura in Bukovina, now in Ukraine. 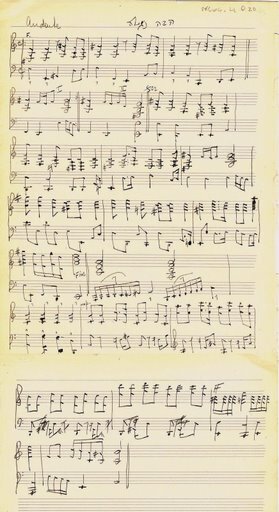 While the exact date of composition is not documented in any of Idelsohn's manuscripts, he claims to have written a first sketch of Hava Nagila in 1915. After adding a text, Idelsohn documents the first performance of the song by his mixed choir in 1918, remarking that the performance caused Hava Nagila to, "quickly spread throughout the country." These dates are noted in Idelsohn's 1932 article "Musical Characteristics of East-European Folk song" published in The Musical Quarterly. Idelsohn's Hebrew lyrics echo the biblical verse: "This is the day that God has made. We will rejoice and be glad in it" - "Ze ha-yom asah adonai, nagila ve-nismeha bo" (Psalms 118:24). Later controversy would arise following the claim of Moshe Natanson, a pupil of Idelsohn, that he had written the words for the song. The manuscripts here are part of the Idelsohn Collection at the Department of Music of the Jewish National and University Library. Idelsohn's original manuscripts of the Sadigora niggun and his words for the song. The score of the song in the Thesaurus of Hebrew Oriental Melodies is noted by Idelsohn as having originated in the Sadigora Hasidic Court. 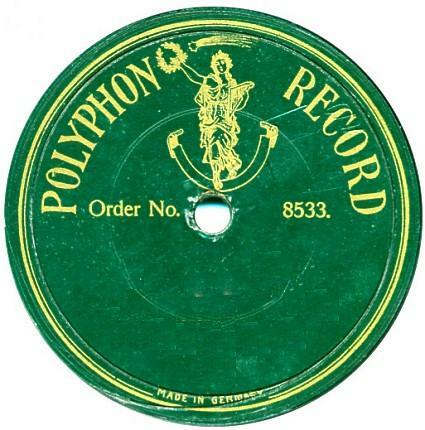 In 1922 Idelsohn was contracted by Polyphon Records in Berlin to release a series of records featuring Hebrew folksongs. Idelsohn selected the repertoire of thirty-nine songs. The series included the first commercial recording of Hava Nagila. To listen click on 'Play' on the record. 1) - The entry for Abraham Zvi Idelsohn on the website of the Jewish Music Research Centre of the Hebrew University of Jerusalem. 2) - From Idelsohn to Belefonte and Beyond - A presentation on Flickr by the Jewish Music Research Centre.